When Benjamin Britten was made a Freeman of Lowestoft on stage at the Sparrow’s Nest Theatre in 1951 he declared, ‘I am first and foremost an artist - and as an artist I want to serve the community’. Eight years later he would achieve that by bringing his people’s opera Noye’s Fludde to St. Margaret’s Church. Written primarily for an ensemble of amateur young performers and musicians, it premiered the year before in Orford and the original cast of notable principle performers brought it to Lowestoft: Trevor Anthony, Owen Brannigan, Gladys Parr, the conductor Charles Mackerras and an as yet unknown, yet highly promising young singer by the name of Michael Crawford. 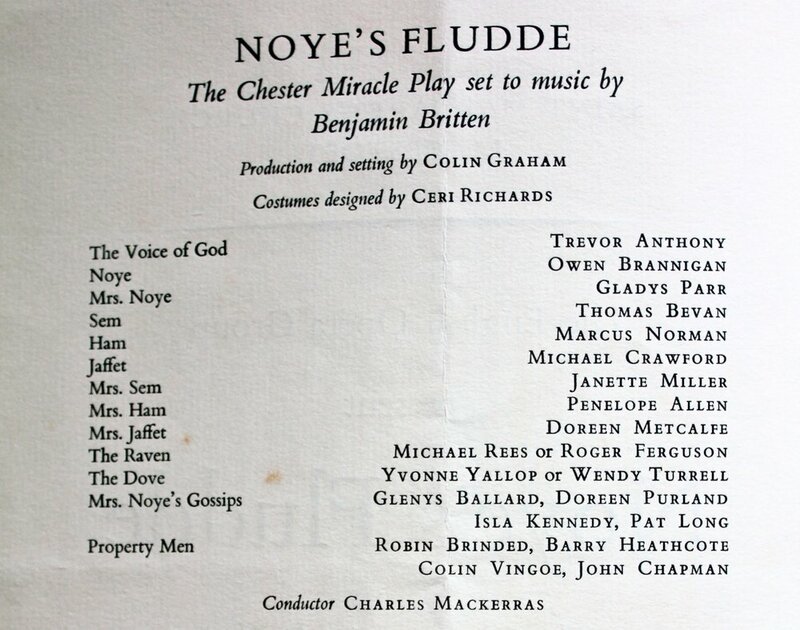 When I was invited to take part in this production in my home town for the Britten Centenary I had no idea it had been staged there before, in 1959 and I was keen to talk to some of those who were involved in that production. Its subject of an almighty flood and God’s promise to spare mankind from such a fate again must have had a particular resonance at the time, just six years after the devastating flood of 1953 that came without warning and engulfed Lowestoft’s sea defences, putting much of the town under several feet of water. Worshipers at Britten’s childhood church of St John’s had to be rescued from choir practice by rowing boat, people were plucked from their upstairs windows and some were unable to return to their homes for up to six months. At the time Britten was living at Crag House, on the sea front at Aldeburgh and would have been directly affected. His experience of surviving the near Biblical storm-tide must have influenced his choice of material for his children’s opera, which he completed in a matter of weeks in 1957. Pat Nicholson was a Cello teacher and member of the orchestra for the Lowestoft performances; her husband was a schoolfriend of Britten and, as Chairman of the Further Education Sub-Committee, was one of those instrumental in bringing the opera to the town. I met Pat in August in her beautiful garden which leads down to the river at Oulton Broad. ‘Ben used to bring any awkward guests here for tea’, she admitted wryly. ‘He would drive them to Lowestoft to show them where he lived.’ I asked her what he was like, ‘Delightful, a good family friend and surprisingly diffident. He came here once when he was recording A Midsummer Night’s Dream and said, “You know this is all so difficult for an amateur like me.”’ With generous continuity Pat’s family have helped to support this special centenary performance. The orchestra for the Lowestoft Noye’s Fludde rehearsed at The Grammar School (now the Ormiston Denes Academy) and had lessons from the great percussionist James Blades who had devised many of the special sound effects for the opera such as the slung teacups beaten with wooden spoons to simulate the arrival of the rain. Pat remembers him demonstrating how to produce a strange shimmering sound with a tambourine by licking the side of the instrument and then running his finger around the edge. He told the children he would get one of the teachers to show them how to do it and pointed at Pat. ‘He got me up on stage and I felt an absolute idiot. I was standing there trying to make this noise and couldn't do it. He had a wicked sense of humour.’ Pat also claimed that the orchestra had the J. Arthur Rank gong, which would have seemed plausible given that it was James who had famously struck it for the opening of every Rank Film (although the one we saw on screen was really made of plaster). This on-stage intimacy didn’t help the children's coordination; Thora remembers that during one performance half the animals went one way and the others ended up having to sing from behind the ark; also the rainbow, which had to be winched by hand, got stuck and so God appeared to only half promise never to destroy mankind ever again. Michael Crawford remembers how enthusiastic everyone was because they wanted to impress Mr. Britten, ‘He was a kind man and the best kind of teacher, especially as an introduction to classical music. You long for a teacher to draw out of you something that you otherwise might never have discovered.’ Crawford, who was just 14, remembers that during the Orford production his voice began to ‘slide down a bit’ and so Britten changed the key. He still has the score to this day, transposed in Britten’s own hand and remembers how exciting it was to try out his new part. Pat Nicholson remembers Britten being very present at rehearsals. I asked if she thought he was pleased, ‘Oh yes, although there was a slight problem with the buglers; I seem to remember they had the wrong bugles, there was a bit of a panic about that.’ Similarly the conductor Charles Mackerras was losing patience with the gossips who, true to their name, seemed to be a little slow to respond to his direction.